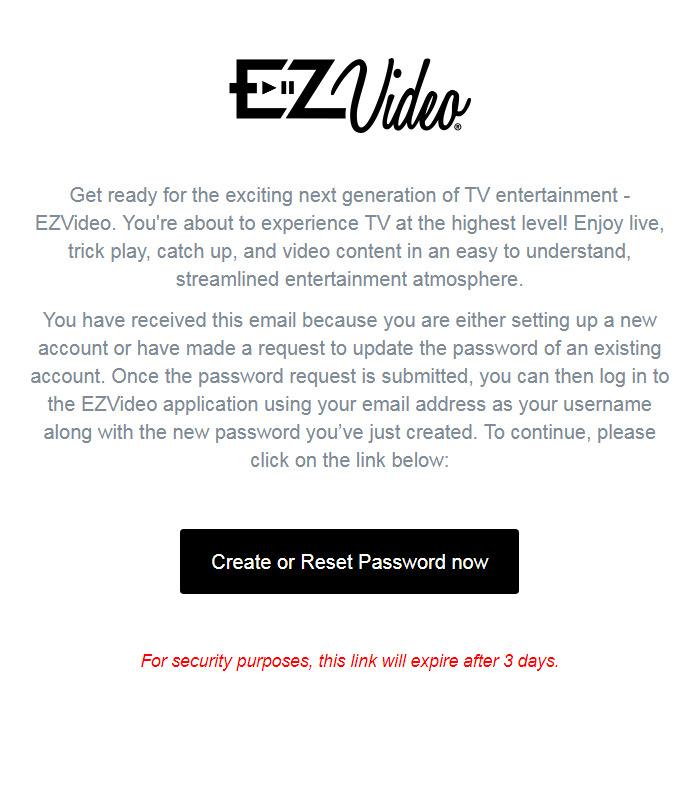 When you first sign up for EZVideo, you will receive an email with a link to set up your EZVideo account password. The image below is what you should see in your email. You may have to check your spam or junk folder incase your email provider or client has filtered it accidentally. Note: this email will expire 3 days from when it was first sent. If the setup email has expired please call into Technical Support and we'll send you a new one. Click on the button that says "Create or Reset Password now" and you will be taken to a screen to enter your desired password. Confirm the password and submit. Make sure to keep track of this password for future use, if you forget your password you can request a reset at the main https://www.ezv.tv sign in screen. Once this password has been set up successfully, you'll be able to use your email and password to sign into any version of EZVideo across all of the various platforms.